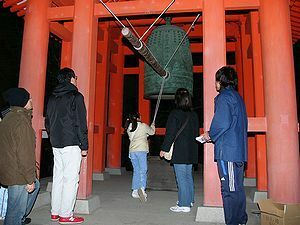 On New Year's Eve temple bells are struck 108 times in Japan..
and they cause human suffering. and they welcome the new year in with a refreshed feeling. Actually, the number is different depending on the era, sects, denominations and schools. The smallest is 3, popular number is 108 and the biggest number is approximatery 64,000. 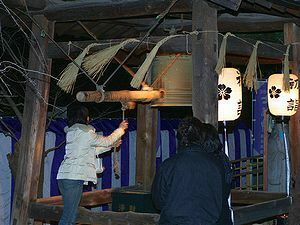 Onomatopoeia of a bell peal is " Goooooong/ゴ〜〜ン "
Schedule, fee, etc. are subjects to change on very short notice. Kenchu-ji: First come 108 people. 100yen. Tickets are sold from Dec.1. Dec.18 for first come 108 people. The tolling starts from 0:00.